Sunday the weather was horendous. 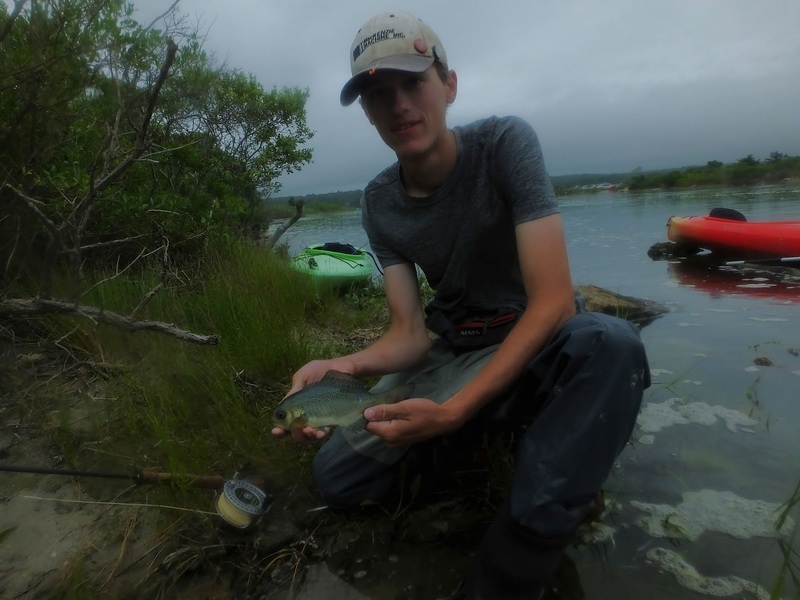 As a weather system that would be in place over New England for days pushed onshore in western ME Noah and I were looking for stripers in a large tidal creek with ripping currant. There were some fish there. We saw a brief blitz on the other side. But as the wind shifted from ENE to SSW it became clear we weren't catching anything here. We made a last ditch effort to catch one of our other target species, pollack, in Portsmouth. Heavy rain and wind chased us out of there, but it had already become quite clear to us that we weren't going to get any harbor pollack there. Next up, back in Gloucester, this time on the north side of town. Clear water, great current and wind. Not one fish to be found. Then, our fateful last step. We decided to pay a visit to Rhode Island, and some water I hadn't fished in a while. 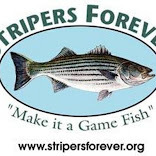 We found stripers there, but the conditions had made it excessively difficult to fish for them. I got some chases and takes, including from one exceptionally large bass. But it was just not meant to be. We paddled out through the breachway, working hard against a very strong flood tide being enhanced by powerful southerly winds. I spent most of the time, as I usually do, looking at what was in the water. I saw bait everywhere. Then I saw this fish roll, right off the bow of my kayak. I thought it was a schoolie bass. As I approached the weed clump under which the roll had occurred I saw something there I had never seen before. It looked to me like some sort of dark colored, ugly permit or pompano. I simply did not know what it was. But I had to catch it. And somehow, luck was at my side. That weird little fish hung around long enough not only for me to get multiple shots at hooking it but long enough that Noah was able to figure out what it was, which was also by luck. He had read a brief on the water article about a strange little fish caught in the Cape Cod Canal. A barrelfish, it was called. Hyperoglyphe perciformis. So named because until fishing and boat technology reached a point where species that existed in 600 feet of water or deeper could be targeted, this species was only known by it's juvenile form, which often were found in floating debris, such as barrels. Every once in a while one of those barrels, buckets, or clumps of weeds gets blow way out of the normal territory of barrelfish. It is rare, but these deepwater, offshore fish occasionally show up inshore. Their adult form is caught fairly frequently in water as deep as 1700 feet off of the Carolinas and Florida, but they had never been observed underwater until 2005. I've found exactly two photos of juvenile barrelfish caught inshore and read of other instances after hours of diligent searching. Information on this species in general is sparse. We know exceptionally little about them. What I can say with near certainty is that until July 22nd 2018, nobody had ever documented catching a barrelfish on the fly. It has been, for a number of years now, a goal of mine to catch a species that had never before been caught on the fly. If there were any on my life list that I suspected could already be that fish, it was bluespotted sunfish. But there is too much uncertainty there for me to actually say that this is true. But this weird, uncommon fish, barrelfish... this is it, the holy grail for me. I am nearly certain of it. Nobody had ever put a fly in one of these fish until I did. It was unexpected. It was luck. It was absolutely unpredictable. But it happened. And since Sunday I have felt like a balloon being over-inflated and about ready to pop, because holy hell Noah and I just documented catching a fish nobody else had with a fly rod. 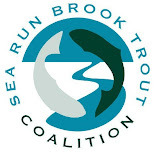 I'd say this is right up their with my Salmon River Atlantic salmon but other people had done that. This was one in a million. This was extraordinary. And I'm not sitting here tooting my own horn, that's not what this is. I am immensely grateful to have been presented with the opportunity to hold that little fish. It was a privilege like no other I've ever been given, thanks to a powerful storm that blew the exact right clump of debris into the exact right breachway at the exact right time. This was a fish of a lifetime. I'm grateful that Noah let me make the casts. I'm grateful that the fish didn't leave the scene. I'm grateful that I was even there to see that fish in the water, let alone catch it. This is a first for me, and given how many fish species their are out there and how few people are out there building fly rod specific life lists, I doubt it will be a last. But in the end, the goal for me, and for many lifelisters, is to catch that one fish. A fish that nobody has ever seen before. Something without a name. To do that with a fly rod, that is my ultimate. That, is crazy cool! Thanks for sharing the adventure with us! It's my pleasure. All I hope is to inspire a few along the way. You just never know what you will see and catch when fishing and that's what makes it such a great job. NICE!!! It's a cliche I don't like, "never knowing what you'll catch", because the entire journey for me is about getting to the point where I do know. But for now it is absolutely true. Howsoever improbable an event may be, if it is possible it will occur. In this instance it happened to you. Congratulations!